Several times during Andean prehistory people coalesced into large political entities. It is therefore possible to consider an Andean civilization and tradition. One indicator of this social and political unity is Quechua, presently spoken by some 10 million people from Ecuador to Argentina, a distance of thousands of miles. Quechua refers to the mountain zone between 3,000 and 11,000 feet in the Andes of South America. Only in historic times has the term been applied to Runa Simi, the language of the Inca civilization. Most of the descendants of the Indians of the Incan realm are the present-day Aymara and Quechua speaking peoples of the Andes. Quechua speakers constitute almost half the population of Perú. Aymara and Quechua traditions are very similar and were unified under the Incas and possibly under previous political centers, particularly Tiwanaku. The Andean region produced a unique emergence of civilizations at an early date. A pre-agrarian, pre-ceramic adaptation to rich, easily accessible maritime resources coupled with a vertical adaptation to nearby stacked mountain resource zones enabled very early sedentary communities to develop along the Pacific coast. Populations grew to 1,000 to 3,000 person villages and large monumental architecture developed. Contemporaneous to the construction of pyramids in Egypt and ziggurats in Mesopotamia, Peruvian coastal communities cyclically renovated ever larger pyramidal platform mounds. Aspero, a large early center with platform mounds, has 4800 to 5000 BP. carbon 14 dates from late phase construction. Cultigens are first known in South America from 10,000 BP. Coastal agriculture included introduced cultigens from both the highland and Amazon zones. A two hundred kilometer transect of the Andes includes twenty of the world's thirty four life zones in a transition from extreme aridity to extreme altitude and then extreme humidity and rainfall. 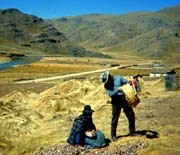 Interaction, exchange and multiple zone exploitation of this diverse region was facilitated by the beast of burden adaptation of the llama. During the Pre-ceramic Period (5000 - 4000 BP.) cultivated squash and tubers introduced from the highlands, tropical tubers, beans and peppers from the Amazon and a variety of local wild grasses, seeds and fruits were exploited. By 4,000 BP. irrigation agriculture appeared in coastal valleys. Coastal-Andean interaction spheres are especially evidenced during the 4000 - 2800 BP. Initial Period, when more mound building occurred than during any other period. Initial Period centers share a characteristic U-shaped site layout and mountain facing orientation. Sechin Alto grew to be the largest. In 3400 BP. 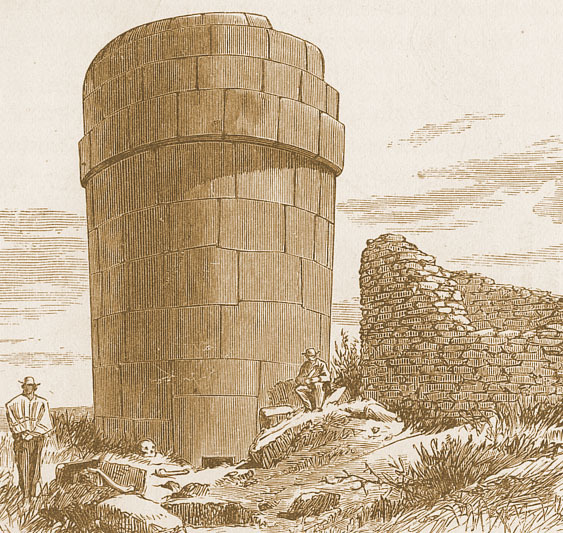 Sechin Alto's 300 m. by 250 m. by 40 m. high colossal, stone-faced mound was the largest American monument. 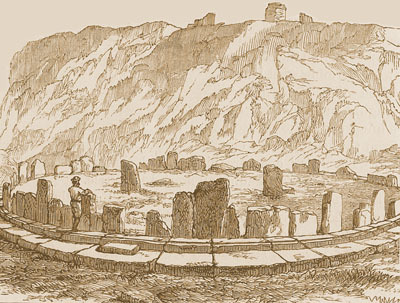 Chavín de Huantar is erroneously viewed as the first South American civilization horizon and coincides with the Early Horizon (2800-2200 BP.). Chavín, located on a principal pass from coast to jungle, is a monumental site with finely carved stone sculpture with elaborate iconography and art. The homogeneous Chavín style followed a diverse heterogeneous pattern in Initial Period ceramics. At Chavín the monumental architecture includes a U-shaped principal mound oriented to face the rising sun. Deep within the platform mound a cruciform chamber is centered on El Lanzón, a thirteen foot tall, prism-shaped stela that extends from floor to ceiling. Carved in bas-relief, the stela depiction includes a standing anthropomorph that combines feline characteristics and serpent depiction. Around 2250 BP., military architecture appears, coincidental to an apparent disruption of regional integration. A second significant South American center emerged in the southern uplands at Tiwanaku on Lake Titicaca. The immense lake's 12,600 feet above sea level shoreline supported a dense population. The Tiwanaku survival strategy augmented the Andean agropastoral adaptation with a combined raised-bed and shoreline canal agriculture system. The water temperature in the canals mediated frosts, effectively extending the short, high-elevation growing season and increasing yields. Tiwanaku culture became the largest Andean regional integration and enjoyed an unprecedented longevity of 1400 years. The Tiwanaku polity covered large portions of Bolivia, Argentina, Chilé, and Perú. At Tiwanaku one of the great Andean platform complexes and one of the highest urban centers ever, was built around 2400 BP. It grew to house from 25,000 to 40,000 people. Tiwanaku's central monument precinct covers twenty hectares and is laid out on a cardinal direction oriented grid. The enormous Akapana mound is 200 meters long per side and stands 15 meters tall. Its andesite facing was quarried at 100 kilometers distance. Many of the major buildings date from the Early Intermediate period (AD 200-600). During the Middle Horizon (AD 600-1000) Tiwanaku influences are seen throughout the central and southern Andes. 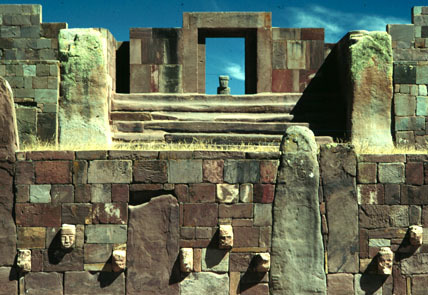 Tiwanaku declined around 1000 BP. 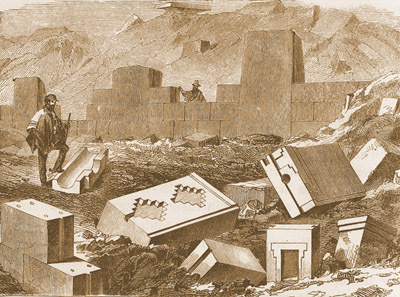 Abandonment of the raised bed-canal agriculture system, due to a natural lowering of the Altiplano's rainfall and the consequent lowering of the basin's great lake may have contributed to the decline of the great city. Moche civilization became a regional integration of part of the northern Andes contemporaneous with Tiwanaku. The Moche constructed the largest Andean adobe structure, the Huaca del Sol, one of the two or three largest South American monuments. The Moche were followed by the Chimor. They consolidated 1000 km of coast under the second largest prehistoric polity in South America. Numerous other regional polities have played a role in the development of Andean civilization. Local hegemonies, some coastal, some montane and still others bridging geographic barriers, had risen, expanded, and collapsed prior to the Incan regional unification. The greatest of all central polities of the Andes, the Incan civilization, unified the Andes a mere century before European intrusion. The Inca state was called Tahuantinsuyu, the 'Land of the Four Quarters,' and was centered on Cuzco, Perú. Inca was a title bestowed on the political leader and referred to the ruling ayllu (kinship group). Today Inca refers both to the people and the polity. 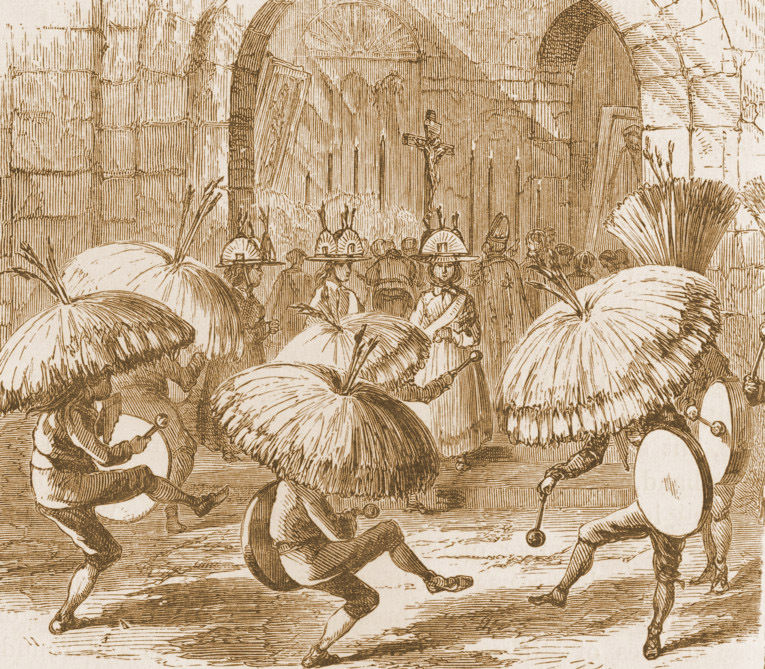 The first Inca, Manco Capac, was revered as a civilizing hero. According to Garcilaso de la Vega's version of Andean history, Manco Capac came from the Lake Titicaca region. Felipe Gauman Poma de Ayala wrote that the first Incas came from Lake Titicaca and Tiwanaku, lived in Tambotoco (also called Pacaritambo) and four brothers and four sisters left to found Cuzco. These included Manco Capac and his wife. Pachacuti Inca Yupanqui, the ninth Inca, is considered the greatest Inca. Around 1438 Pachacuti replaced his brother Inca Urcon after overcoming the Chanca invasion. Pachacuti consolidated a large polity, a territory spanning from the Titicaca Basin to central Perú. Pachacuti is credited with the construction of many monumental sites and with instituting wise laws. He reconstructed Cuzco, built the Coricancha, the so-called "Temple of the Sun," and initiated construction of Saxsayhuaman. Saxsayhuaman's polygonal masonry terraces include many immense stones. 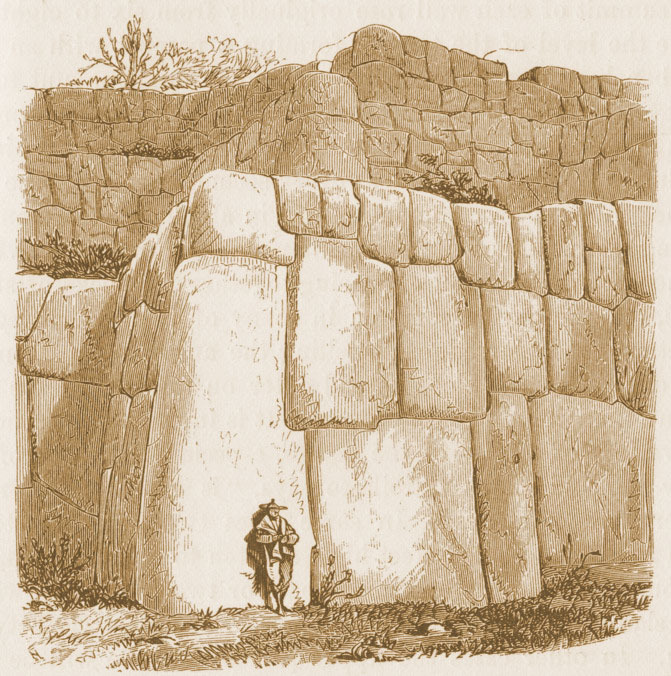 The largest, a twenty-eight feet tall stone has been liberally estimated to weigh over 360 metric tons (conservatively at 120), one of the largest stone blocks ever incorporated in a structure. In 1471 Pachacuti was succeeded by his son Topa Yupanqui. Topa Yupanqui added Ecuador and northern Perú to Tahuantinsuyu. In a few generations the Incas consolidated under one government the Andean region from the border of Colombia to the Rio Maule in Chilé, nearly 400,000 square miles, potentially the largest nation on the earth at the time. This area twice the size of Spain encompassed at least 12,000,000 people who spoke more than 20 languages. More than 100 independent ethnic groups had been consolidated into the Tahuantinsuyu state. Two great north-south roads, one running along the coast for about 3,600 km, the other inland along the spine of the Andes spanning a comparable distance, and many interconnecting links helped unify the realm. The 30,000 to 40,000 km of major roadways was one of the best in the world. A system of runners facilitated communications. Most of the pre-Colombian population lived above 10,000 feet. The prehistoric economy was based on agriculture, its staples being corn (maize), potatoes and sweet potatoes, squash, tomatoes, peanuts (groundnuts), chili peppers, coca, cassava, and cotton. Some forty domesticated plants were cultivated. About 700 variety of potatoes are known. They raised guinea pigs, ducks, llamas, alpacas, and dogs. 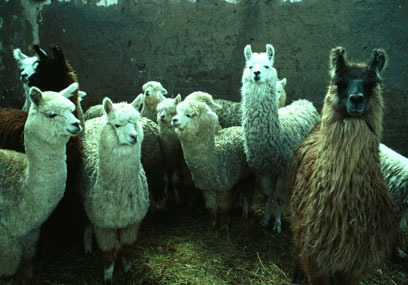 Alpacas and llamas were domesticated for their fleece. 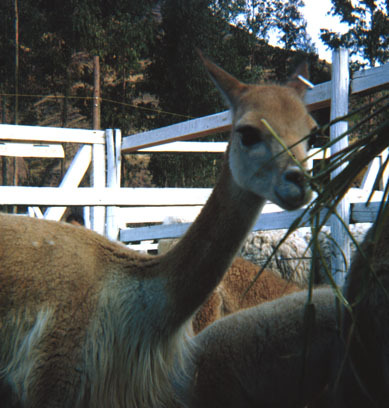 Llamas, the only beast of burden in all the Americas, served as pack animals. Clothing was made of llama, alpaca and vicuña hair and cotton. Houses were of stone or adobe mud. Practically everyone was a farmer, producing his/her own food and clothing. Communities took advantage of the mountain environment by utilizing various elevations and climates. Alpacas grazed the highest terrain where crops could not survive. The Andean peoples are traditionally organized in ayllus, common descent family groups owning land in community. Animals were grazed on common pastures. Land use was from time to time redistributed according to family needs. Irrigation systems supported agriculture where cultivation was otherwise impossible. Terracing converted steep mountains into fertile flat fields. One of the greatest engineering feats of humanity in its time was a river diversions in ancient coastal Perú. Guano from coastal islands was used as fertilizer and guano producing birds were protected by law. The specialized Andean adaptations were highly successful and their cultigens have greatly benefited the modern world. Before the Spaniards arrived in the Andes smallpox and other infectious diseases of European origin swept across the Americas. Two-thirds or more of the population perished before contact, making conquest all the easier. Topa Yupanqui's successor, Huayno Capac, died of European diseases a few years before Francisco Pizarro's conquering band of Spaniards killed his son, Inca Atahualpa. The conquerors first held Atahualpa for ransom. They received a 20 by 18 feet room filled to the ceiling with gold in exchange for the Inca's life before killing him. So began the Historic Period in the Andes.